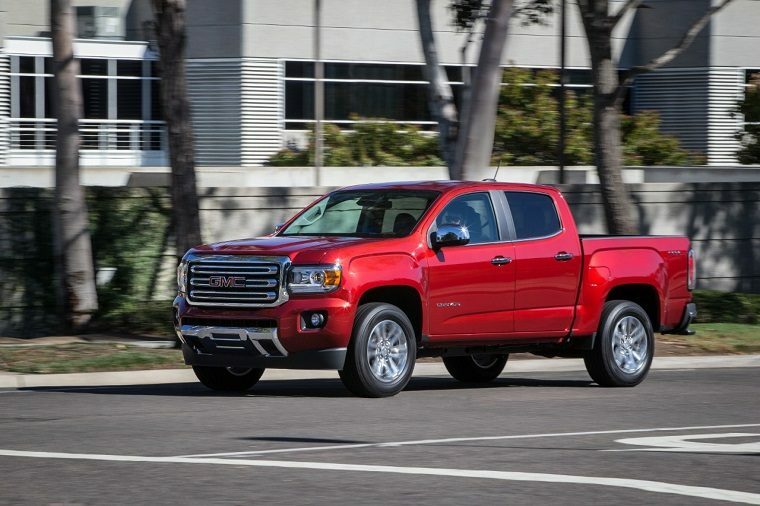 The 2019 GMC Canyon helps drivers tackle tough jobs with a combination of proven reliability, powerful performance, and rugged capability. For the new model year, this midsize pickup truck also features a small but significant number of upgrades. 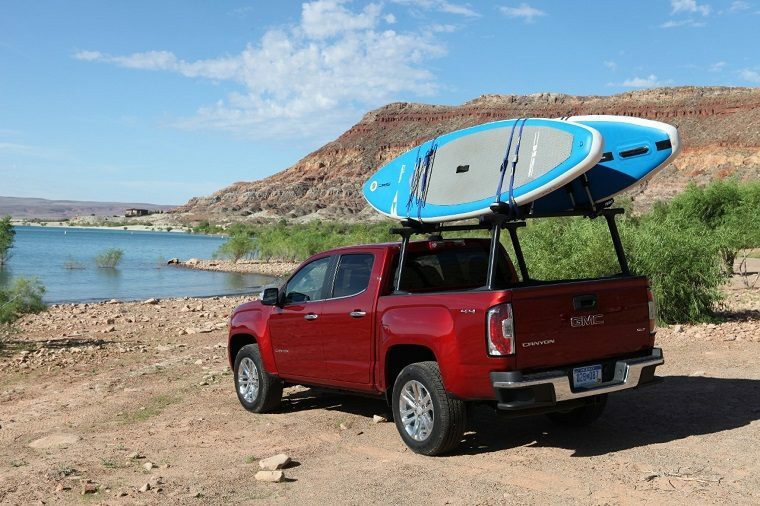 What’s New for the 2019 GMC Canyon? The biggest changes for the 2019 Canyon involve technology. The Canyon’s new 7-inch GMC Infotainment System offers Apple CarPlay and Android Auto smartphone compatibility, enhanced voice recognition, cloud-connected navigation with real-time traffic, and automatic software updates. The 2019 Canyon also gets a digital Rear Vision Camera in place of the previous model’s analog version. Rear Park Assist is now available for the Canyon. SLE and above models get a second hands-free microphone for improved voice recognition, along with a six-way power-adjustable driver’s seat. Exterior changes include new 17-inch wheels for the SLE and four new paint colors: Sedona Metallic, Smokey Quartz Metallic, Dark Sky Metallic, and Blue Emerald Metallic. The 2019 Canyon provides plenty of features to help you work more effectively. The standard CornerStep bumper allows easy access to the bed. Cargo box lighting, an EZ-Lift and Lower tailgate, bedliner with built-in storage, bed rails, and cargo tie-downs are available on all trims above the SL. 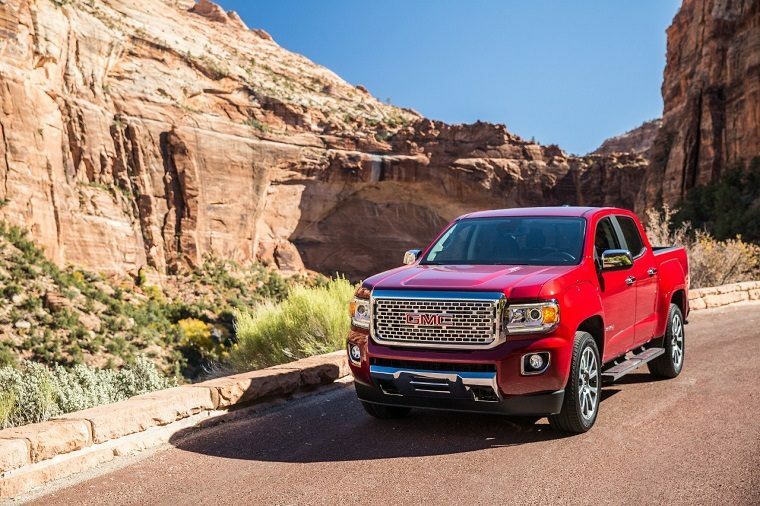 The Canyon also gives you numerous choices for customizing your truck’s look, from the rugged All Terrain to the luxurious Denali. A variety of wheel sizes and styles are available, and you can also choose from different chrome and body-color options for the grille, door and tailgate handles, and mirror caps. The Canyon is offered in three body styles — Extended Cab; Crew Cab, Short Box; and Crew Cab, Long Box — and in either 2WD or 4WD. The SL is only available as a 2WD Extended Cab. The 4WD Canyon is only available as an Extended Cab. The two All Terrain trims are only available in 4WD. 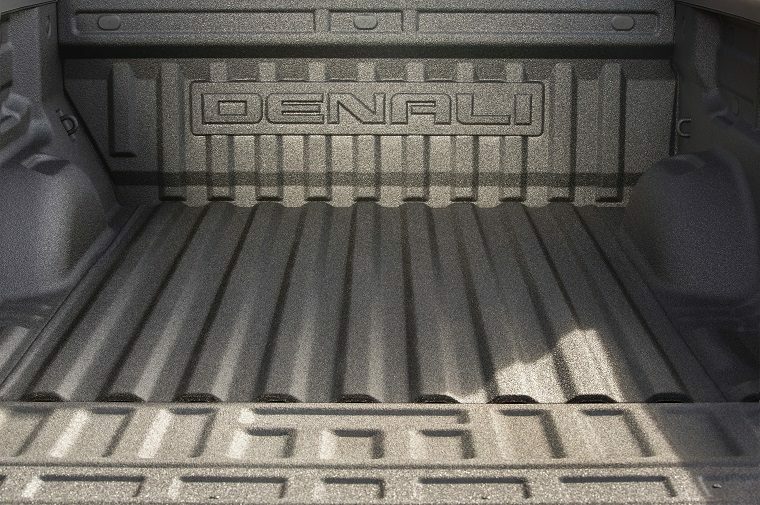 The SLT and Denali trims are not available in the Extended Cab configuration. The 2019 Canyon’s base engine is a 2.5-liter four-cylinder that gets 200 horsepower and 191 lb-ft of torque. It can be paired with either a six-speed manual or six-speed automatic transmission. The next step up is a 3.6-liter V6 that gets 308 horsepower and 275 lb-ft of torque. This engine comes with an eight-speed automatic transmission. 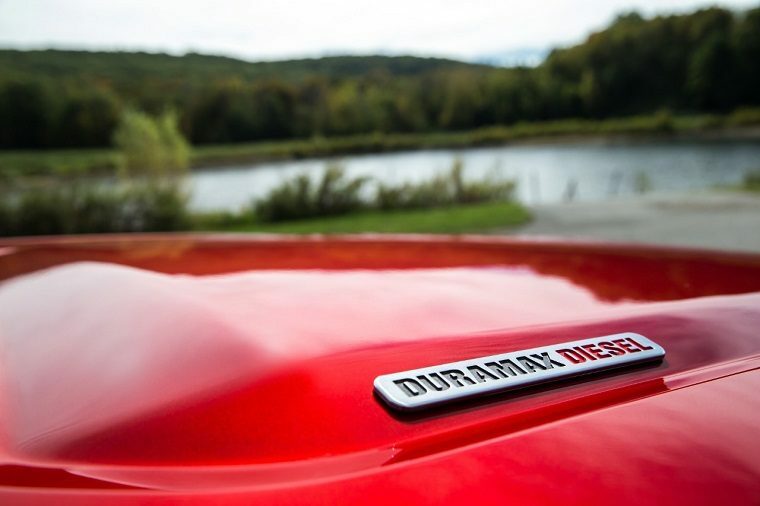 Finally, there’s a 2.8-liter Duramax Turbo-Diesel. This engine, only offered on SLT and Denali trims, puts out 181 horsepower and 369 lb-ft of torque, and is connected to a six-speed automatic transmission. When equipped with the 2.5-liter four-cylinder engine, the Canyon gets an EPA-estimated 20 mpg in the city and 26 mpg on the highway. The 3.6-liter V6 is rated at 18 mpg in the city and 25 mpg on the highway (that goes down to 17 mpg and 24 mpg for All Terrain trims). The 2.8-liter Turbo-Diesel is the Canyon’s most efficient engine, achieving 22 mpg in the city and 30 mpg on the highway. 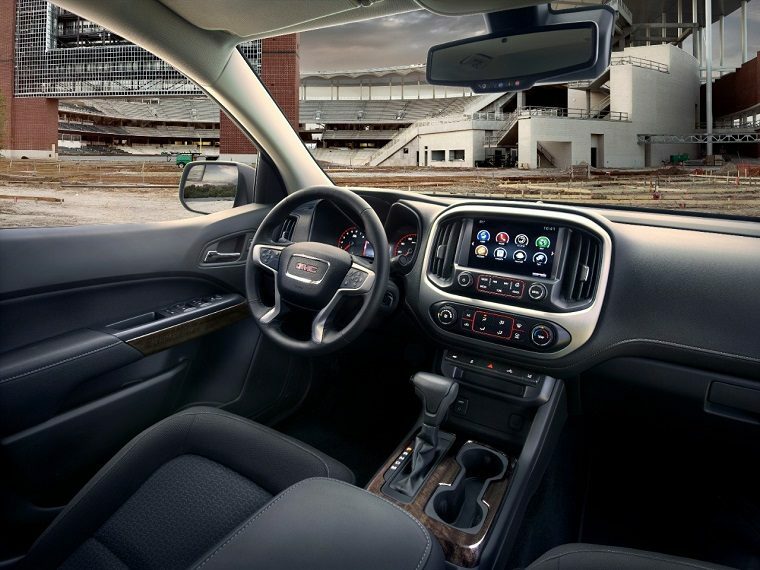 All trims of the 2019 Canyon feature the new GMC Infotainment System, a six-speaker audio system, voice-activated technology, and Bluetooth. Higher Canyon trims offer premium features like wireless charging, cloth or leather seat trim, heated steering wheel and seats, a Bose premium audio system, and built-in 4G LTE Wi-Fi. The 2019 Canyon’s standard Rear Vision Camera makes it easier and safer to maneuver the truck while carrying big loads or working in tight spaces. For safer performance, the Canyon’s electronic traction and StabiliTrak stability control systems maintain control and grip even in messy conditions.